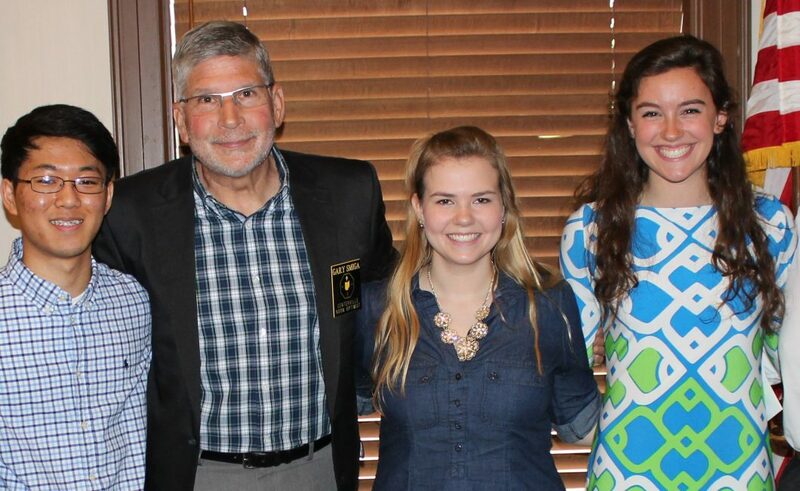 Ellie Parker requested donations for the golf outing gift bags from businesses and others. Some examples would be snacks (chips, pretzels), gift cards, and more. She will come to you and pick up your donations. Jerry Stahley is still looking for OI Junior Golf Championship donations for junior golf. He also has two Dragons tickets for 5/18/2018. Chris McAlpine reminded everyone that the Safety on Wheels bike Rodeo is this Saturday May 19, 2018 at Miami Valley South. Myron Rheaume announced he just came back from the OI district meeting in Columbus. They gave him a boxful of Dime-a-Day Pins. He kindly reminded us how to do the math, remember that a dime a day means $36.50 per year. He presented a pin to every club member participating in the Dime-a-Day program. Chris McAlpine read some recent touching thank you notes, including a recipient of a scholarship and a previous speaker from the BOLD program at CHS. Tom Novak spoke to us about the Avenue of Flags (AOF). Thanks to Greg Griffin for the Power Point presentation. The program started in 2005. 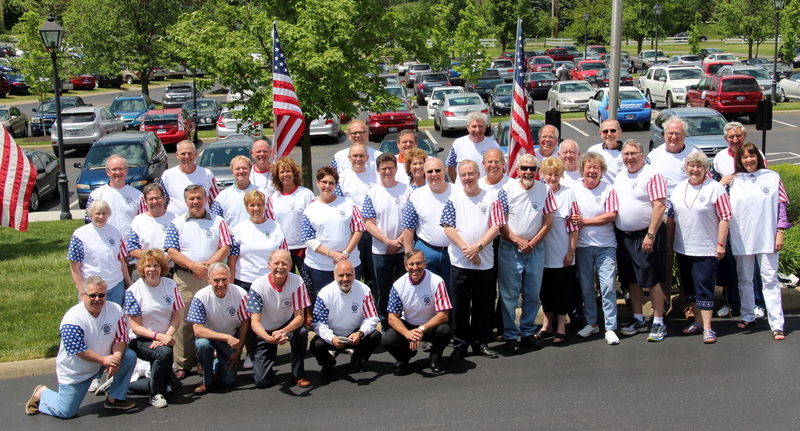 AOF puts flags out 5 times during the year for 3-5 days each on the following flag holidays: Memorial Day, Flag Day, Independence Day, Labor Day, and Veterans Day. To test the fundraiser the first year they put out 30 flags for free in Quail Run. If Chuck Dickerson had not put up the initial $3000 in funding, the program probably would not have started. Thank you to David Watkins of Turf Nerd Lawn Care 75 Westpark for storing our flags free of charge. Thank to the AOF committee and all the helpers. There are over 100 helpers, not all of them CNO members. There are groups that volunteer together from VFW Teams and Bluestar mothers. The are also 40 subscriber volunteers that are not CNO members. The Avenue of Flags committee have learned by doing. They offer volunteers flexible delivery times and early flag loading. GPS helps a lot. New routes are added every year. Trucks, vans and SUVs are great flag vehicles, but some routes are handled by cars and convertibles. There are now 62 Routes. There are a few mega routes with over 100 flags. 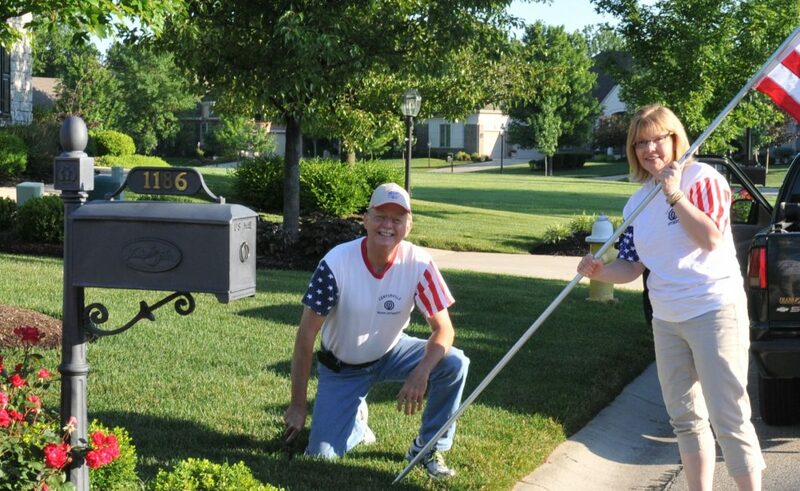 The largest route, handled by the team consisting of Mike Bevis, Donna Huss and Rhonda Meeker, delivers 129 flags. The average route size is 25-35 flags and only takes 1 – 1 ½ hours to distribute. The smallest route is 4 flags. The routes are designed to be concentrated which speeds distribution. Neighbors sharing the service idea with neighbors helps increase subscribers each year. Tom introduced Mike Brubaker, who went over the statistics of revenue. Last year AOF raised over $62,000. Last year we reached 1831 flags for Veterans day. This year so far AOF has 1846 flags for Memorial Day. This is the first year the flag subscriptions at the beginning of the year exceeded the number of subscriptions at the end of the prior year. New orders are coming in every day and they will continue as the season progresses. 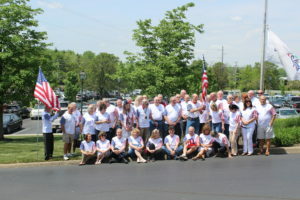 After today’s lunch a group picture in official AOF tee shirts was taken. No readings or inductions this week. Myron Rheaume In the parking lot today, a young lady with a golf cart gave him a ride. As she dropped him off she said she felt good helping a senior. With Spring in full swing and the memory of the cold winter gradually fading, I’ve often thought it would have been great if you made us to go to sleep at the start of winter and wake up in the Spring, just like You do for Mother Nature. Was that in Your plan and Adam and Eve changed that too. Too bad You don’t grant Mulligans or what some call “do overs”. I’m sure that by not getting what we want is a stroke of luck. For we have learned that the upside of painful knowledge is far better than blissful ignorance. Your promises are golden for how dismal November would be if we had no knowledge of Spring. Just rambling Lord, we pray that when this life is over, we all want reservations in the non-smoking section. Amen! 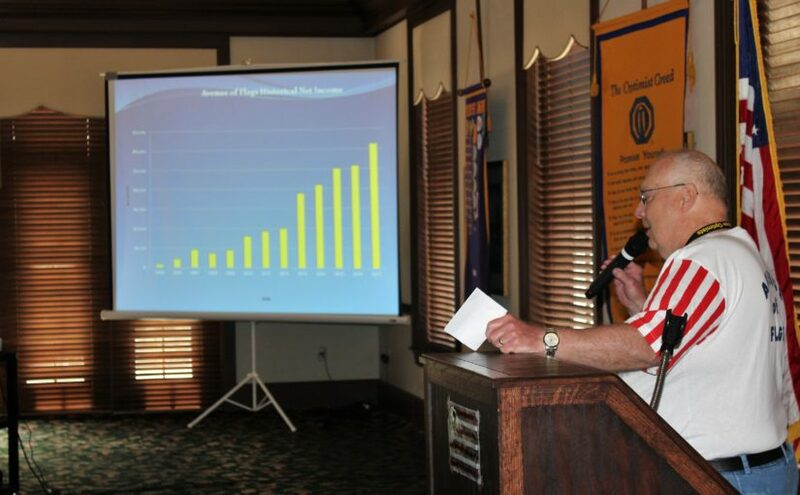 Tom Novak spoke to the club about our Avenue of Flags program. We are rapidly expanding with 1,493 subscriptions before the season officially begins. AOF is one of the top three fund raisers for CNO, in each of the last three years, we have earned over $50,000 for the club. We get volunteers from our membership as well as VFW and Blue Star Mothers for flag distribution and pick up. Memorial Day will kick off the 2017 AOF season. The second part of today’s program included the Kalaman Respect for Law award. Bob Burkman spoke about the CNO creation of this award nearly 20 years ago. Next, Gary Anderson introduced Captain Jeff Papanek who praised our 2017 recipient, Gary Ridgeway, and explained his career and responsibilities. Detective Ridgeway then spoke, after accepting the award from President Larry, about what a great honor it is and amused us with an interesting anecdote about shoe polish in the brim of a cowboy hat. Paula and John Kalaman spoke briefly about keeping their son John’s memory alive. 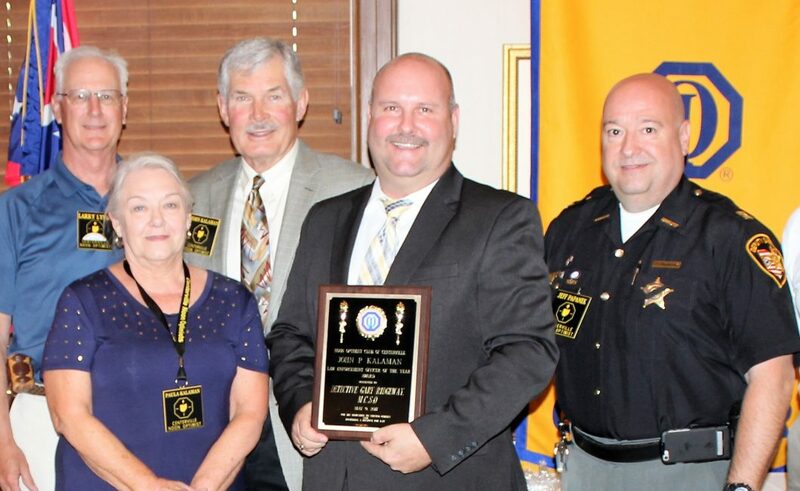 We are all proud to have the Kalamans and Captain Papanek be a part of the CNO family and congratulations again to our award recipient Detective Gary Ridgeway! 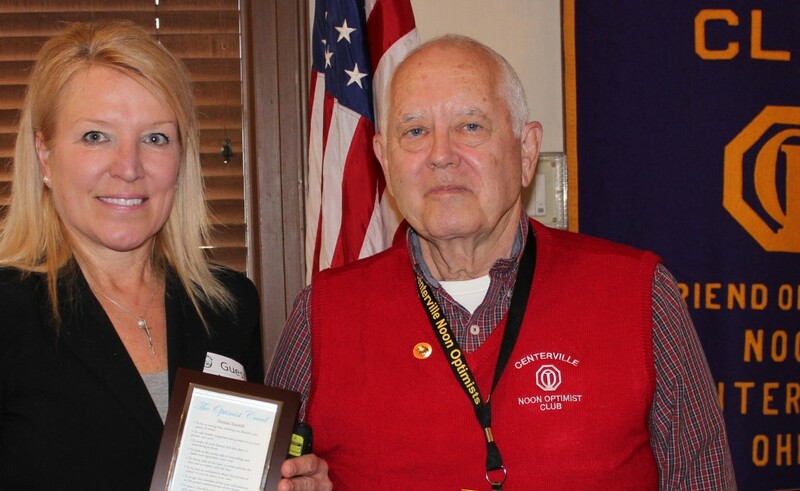 Our own Centerville Noon Optimist Club Avenue of Flags program – one of our three major fundraisers for our local youth – has received international recognition as a “Benchmark Club Project” by Optimist International. OI featured our program – which has grown from 30 flags (in 2005) to over 1,500 flags this year – as the kind of fundraiser that other clubs might consider as a program to help support their youth scholarships and free youth events – as our club does. And a huge THANK YOU to all of our 1,500+ Avenue of Flags Subscribers – your subscriptions provide a major portion of the financial support we receive to help kids in our local community. We could not do it without you. 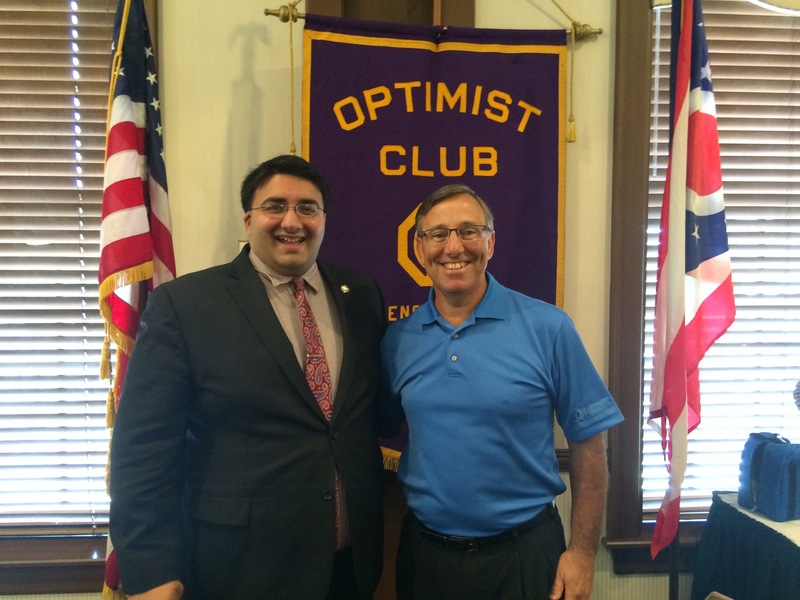 Read the article on the Optimist International Website. To get more information about our Avenue of Flags program or to subscribe.